Vinyl floor tile is a soft floor covering that can be installed over nearly any smooth, flat substrate. It comes in self-stick varieties as well as those that require a separate adhesive. Depending on the variety chosen, it can even be grouted to look more like a hard tile floor. Installing vinyl tiles is often easier than other tile installations, and is perfect for the novice do-it-yourselfer. Choose tiles that require adhesive for heavy traffic areas, such as entryways, playrooms and kitchens. Choose tiles that have the option of grouting them for areas that get subjected to moisture, like bathrooms. 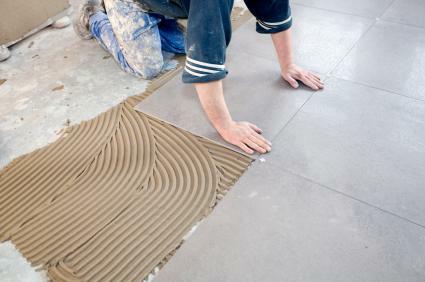 Choose non-adhesive backed tiles if you plan on cutting the tiles to create patterns. Vinyl tiles conform to whatever surface they are laid on. Make sure the substrate is clean, dry and perfectly smooth to prevent bumps or indents being visible under the vinyl. 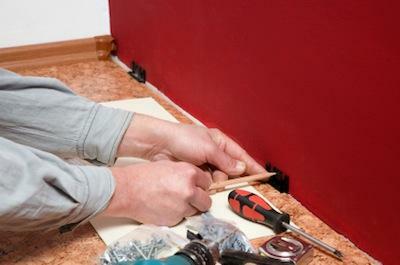 Cement backerboard is a good choice, but wood and cement floors can also accept vinyl. Expect the installation to take several hours to a day depending on the amount you have to install. Locate the wall furthest from the door you enter the room you are tiling by. This is the wall you will begin your installation on. Measure the wall and locate its center point. Snap a chalk line from this point across the room to the wall opposite. This will help keep your layout level. Dry layout your vinyl tiles. This means laying them down with no adhesive or without removing their back coverings. It allows you to plan your pattern and make cuts before you begin installing. Set the first tile directly on the chalk line against the wall furthest from the door. Lay the next vinyl tiles evenly out to each side. This will place cut tiles on the edges of the room, and a full tile on the wall most visible as you enter the room. If you plan on making a border, laying the tiles in a checkerboard pattern or inserting some decorative tiles, plan out your layout at this time. Do not use spacers; even groutable tiles need to be butted against one another. Cut the tiles to fit the edges of the room on a vinyl tile cutter. A vinyl tile cutter operates exactly like a paper cutter; lift and depress the handle to make straight cuts. Curved cuts, or to cut shapes from the center of a tile to be filled with a tile of another color, heat the vinyl with a heat gun and use a utility knife to cut through the vinyl. Step back from your dry layout frequently to make sure your lines are straight, and the pattern looks the way you desire it. Make adjustments as needed. Take up the vinyl in the opposite order from the way you laid the tiles down. Stack the tiles nearby each row for easy access. Spread a small amount of vinyl tile adhesive onto the substrate with a trowel, or peel away the backing on a self-adhesive tile. Press the tiles down onto the floor in the same pattern you determined during your dry layout. Work backwards as you tile so you don't step on the newly applied tiles. In essence, you want to tile yourself back out of the room by the door you entered by. Roll the floor with a 100 pound floor roller. This will adhere the adhesive to the substrate firmly, no matter which type of tile you have chosen. Push the floor roller across the floor several times to ensure a good bond. Grout the tiles if you have chosen a groutable version. The grout joints on vinyl tiles are very shallow, and the grout is very runny. Work carefully; pushing the grout into the joints from several directions using a hard grout float. Clean away the excess grout and shape the grout lines with a grout sponge. Work carefully with a lightly damp sponge to avoid washing the grout back out of the joints again. Allow the grout to dry for 24 hours. 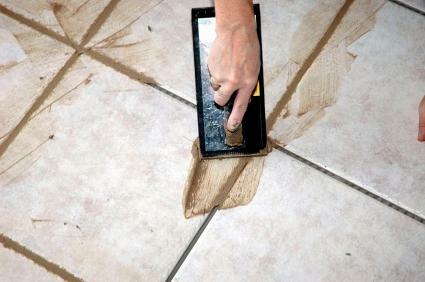 Non-grouted tiles can be walked on immediately after rolling. Vinyl tile adhesive grows stronger with time. A well installed floor can last up to 50 years without any issues. Take the time with your installation and enjoy your new floor for years to come.